It’s been a while since we last discussed statement earrings and how to buy fashion earrings. We shared with you fashion tips and buying advice for various types of statement earrings. But now we have a surprise for you. We know you that you can’t wait to get to your next event so we are going to help you rock it. Read further to discover the best Ana Luisa statement earrings to wear to your next glam party. Before we start, just a quick recap to make sure we are on the same page. Whether all-metal or featuring gemstones, statement earrings are jewelry pieces that draw attention. As opposed to tiny stud earrings and even simple linear drop earrings, statement earrings are usually large and draw attention to your features. Of course, there are some style guidelines when wearing this type of earrings, so, in a nutshell, here’s what you need to know. Statement earrings look best with short hairstyles or updos. Of course, you can wear them with your hair down, but chances are they will get lost among the hair strands. Try to draw attention to them by wearing your hair up. Because they are elegant and draw attention, it is best to wear this type of earrings to a party, formal event or a night out. For work purposes, lunches and other day meetings, choose something more subtle. If you are wearing statement earrings, avoid big, chunky necklaces. You can wear an oversized cocktail ring, but not a statement cuff. Try to keep your other jewelry minimal and subtle so that you earrings get a chance to shine. If you haven’t checked out our online jewelry boutique in a while, you will be surprised by the new styles we showcase. Our earrings collections are much diversified and you are bound to fall in love with our new styles. So let’s see our top picks for statement earrings and our ideas on where and how to wear them. 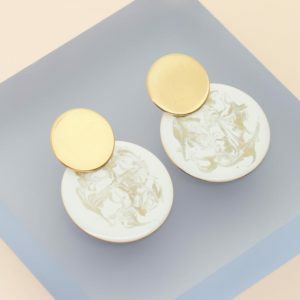 These gorgeous earrings were designed by Instagram influencer Lily (@Styleinbeta), which means that you won’t find anything similar in another jewelry shop. Handcrafted with care and talent and gold dipped in 14k gold, these earrings will take your style to the next level. How to wear them: Their freeform shape is particular and creative, so choose an outfit that matches them. A flowy dress in a neutral tone, along with a pair of summer sandals and a vibrant tote will look great with this pair of earrings. When to wear them: Wear the Lily earrings to a cocktail party where you will make a great impression. 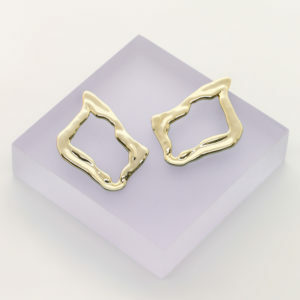 These silver plated geometric earrings have a unique shape and luster that will bring an extra sparkle to any outfit. They work best with round and heart-shaped faces and have a futuristic touch that will make you fall in love with them. 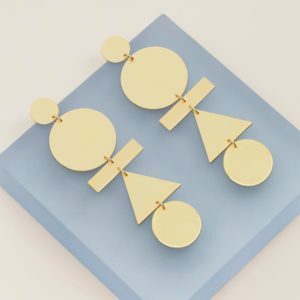 How to wear them: Sophisticated and refined, these statement earrings will look gorgeous with a turtleneck sharp dress, a pair of stiletto shoes and a minimal red clutch. Add a couple of stacked rings on your finger to enhance your contemporary style. When to wear them: The Ruxandra earrings by Ana Luisa will look gorgeous to a formal event, like an office Christmas party. Dipped in 14k gold and with a painted enamel layer, these earrings are both elegant and artistic. Enamel jewelry is big this fall and this particular pair of earrings looks delicious. Refined, contemporary and with a unique look, these ball drop earrings will be your next favorite piece of jewelry. How to wear them: A relaxed updo, along with an off-shoulder beige dress and a precious clutch is the recipe for an impeccable look while wearing these earrings. When to wear them: Wear the Kinoko earrings in style for a going-out night with your friends. These 14k gold dipped dangle earrings will bring an extra touch of elegance and style to your look. 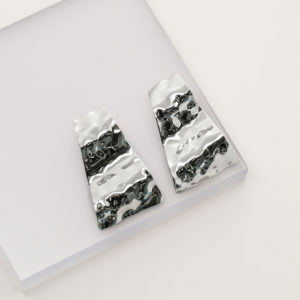 With a sleek texture and a unique design, the Eva statement earrings will help you get noticed wherever you go. How to wear them: Put on your favorite pair of cigarette pants, a blue silk blouse and a pair of elegant sandals to emphasize these earrings. When to wear them: A movie premiere, a theatre show, your choice. These earrings will add the “fabulous” to your outfit. If you want to see more earrings and discover our designer jewelry collections, visit Ana Luisa online jewelry shop.